Collaborations cut deepest when participants tease out the weirder spheres of their vibe venn diagram. 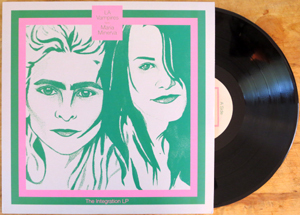 The Integration LP meshes Maria Minerva’s alienated pop constructs with LA Vampires’ degraded Byronic house for a luxe long-player of moodswing motion and freaky feminine mystique, spanning new wave apocalypto, teutonic club dub, and Harajuku romance wave. 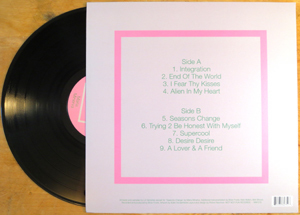 The album began with hazed LA Vampires beats shaped by Maria’s echo vocal constructs, then were further articulated by multi-instrumentalist Nick Crozier-Malkin’s synth leads and drum programming before being filtered through recordist extraordinaire Brian Foote’s masterboard for micro-edits and fine-tuning. The resultant collection is a composite of bleached day-glo rhythm, Shelley poetics, reverbed keys, extraterrestrial romance, seasonal meditation, and smeared studio experiments – unreal and unresolved. Recorded from 2010-2012 in Los Angeles and London. Mastered by Prairie Cat. Cover portrait painting by Katie Vonderheide; design and layout by Rohan Newman.